NAOqi is the name of the main software that runs on the robot and controls it. 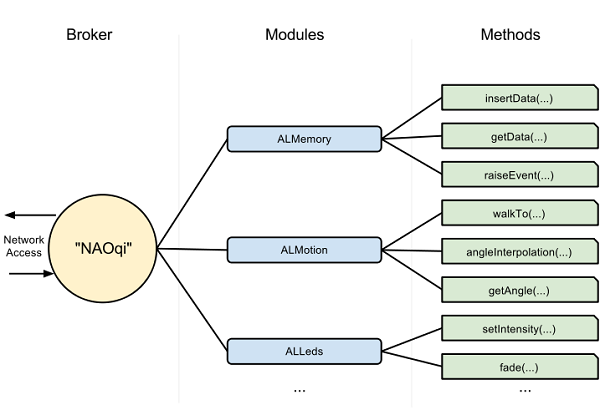 The NAOqi Framework is the programming framework used to program SoftBank Robotics robots. It answers to common robotics needs including: parallelism, resources, synchronization, events. This framework allows homogeneous communication between different modules (motion, audio, video), homogeneous programming and homogeneous information sharing. NAOqi framework is Cross platform and Cross language that allows you to create Distributed applications. The NAOqi framework can be used on Windows, Linux and MacOS. It is possible to develop with NAOqi framework on Windows, Linux or Mac. Using Python: you will be able to easily run your code both on your computer or directly on the robot. 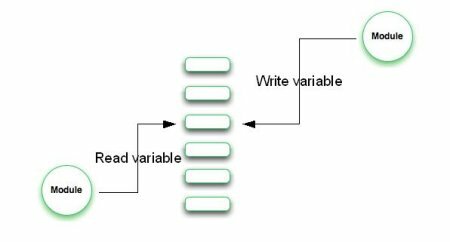 Using C++: as it is a compiled language, you will need to compile your code for the targeted Operating System. So if you want to run C++ code on the robot, you will need to use a cross-compilation tool in order to generate a code able to run on the robot Operating System: NAOqi OS. Follow the step by step C++ SDK - Installation Guide guidelines, in order to ensure you have installed all required tools. Software running on the robot can be developed in C++ and Python: in both cases, programming methods are exactly the same. Beginners should start with Python. It is much easier to learn, and should fit all their needs. A real time application can be, not only one executable, but also several processes and/or modules distributed on several robots. Whatever your choice is, the call methods are always the same. Connect an executable to another robot using its IP address and port, and all the API methods from other executables are available in exactly the same way as with a local method. Note that NAOqi makes automatically the choice between fast direct calls (LPC) and remote calls (RPC). Introspection is the foundation of robot API, capabilities, monitoring and action on monitored functions. The robot knows all the available API functions. Unloading a library will automatically remove the corresponding API functions. A function defined in a module can be added in the API with a BIND_METHOD (defined in almodule.h). Call wait, stop, isRunning on functions. 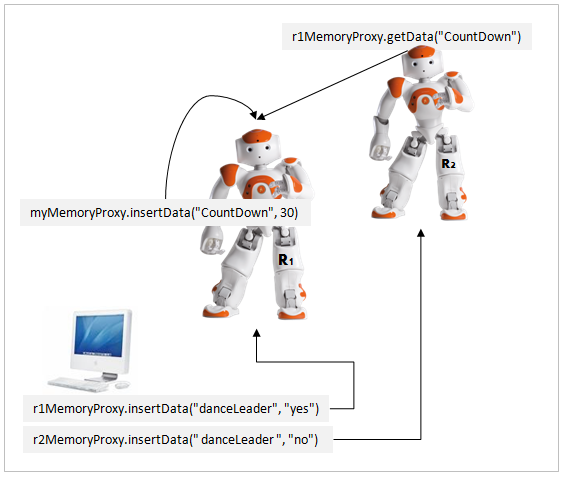 The NAOqi executable which runs on the robot is a broker. 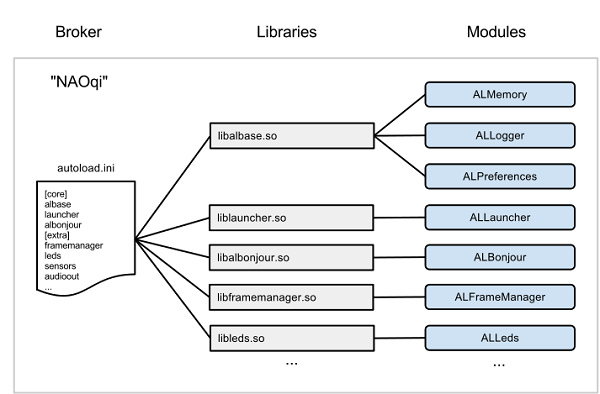 When it starts, it loads a preferences file called autoload.ini that defines which libraries it should load. Each library contains one or more modules that use the broker to advertise their methods. The broker provides lookup services so that any module in the tree or across the network can find any method that has been advertised. Loading modules forms a tree of methods attached to modules, and modules attached to a broker. Directory services: allowing you to find modules and methods. Network access: allowing the methods of attached modules to be called from outside the process. Most of the time, you don’t need to think about brokers. They do their work transparently, allowing you to write code that will be the same for calls to “local modules” (in the same process) or “remote modules” (in another process or on another machine). 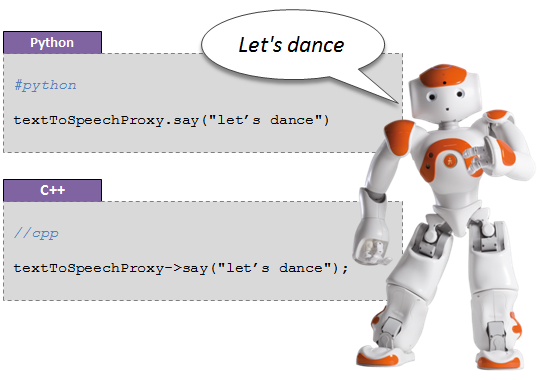 A proxy is an object that will behave as the module it represents. For instance, if you create a proxy to the ALMotion module, you will get an object containing all the ALMotion methods. Simply use the name of the module. In this case, the code you are running and the module to which you want to connect to must be in the same broker. This is called a local call. Use the name of the module, and the IP and port of a broker. In this case, the module must be in the corresponding broker. The full difference between local and remote modules is explained in the Local modules section. Typically each Module is a class within a library. When the library is loaded from the autoload.ini, it will automatically instantiate the module class. In the constructor of a class that derives from ALModule, you can “bind” methods. This advertises their names and method signatures to the broker so that they become available to others. A module can be either remote or local. If it is remote, it is compiled as an executable file, and can be run outside the robot. Remote modules are easier to use and can be debugged easily from the outside, but are less efficient in terms of speed and memory usage. If it is local, it is compiled as a library, and can only be used on the robot. However, they are more efficient than a remote module. Each module contains various methods. Among them, some methods are bound, which means they can be called from outside the module, for example inside another module, from an executable etc. The way to call these bound functions does not vary if the module is remote or local: the module automatically adapts. Local modules are two (or more) modules launched in the same process. They speak to each other using only ONE broker. Since local modules are in the same process, they can share variables and call each others’ methods without serialization nor networking. This allow the fastest possible communication between them. If you need to do some close loop (enslavement for example), you MUST use local modules. Remote modules are modules which communicate using the network. A remote module needs a broker to speak to other modules. The broker is responsible for all the networking part. You must know that remote modules work using SOAP over the network. You cannot do fast access using remote module (direct memory access for example). Remote modules can speak with other modules by connecting their brokers to other modules’ brokers using a proxy. A connection Broker to Broker opens a mutual communication. Modules from both brokers can talk to each others. A Proxy to Broker connection opens a single way of communication. The proxy can access to all modules registered to the broker BUT the modules registered to the broker cannot access to the module that owns the proxy. You can connect two modules together by connecting their brokers. For example, you have two modules B and C. When you connect their brokers, B can access to C’s functions and C can access to B’s functions. Since module’s broker is already connected using --pip and --pport, you do not need to specify IP address and port number when you create a proxy. You can connect your module to another one without specifying --pip and --pport. To do that, you need to create a proxy inside your module and connect it to the broker IP address and port number you want. For example, you have two modules B and C. When you connect B to C just using a proxy, B can access to C functions BUT C cannot access to B functions. Blocking calls Like normal method calls, simple calls are blocking - The next instruction will be executed after the end of the previous call. All calls can raise an exception and should be encapsulated in a try-catch block. Calls can have return values. 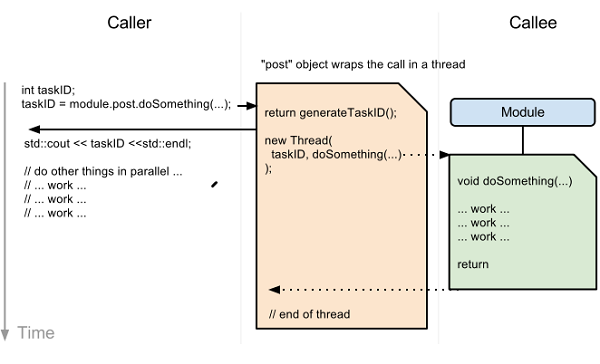 Non-blocking calls By using the post object of a proxy, a task is created in a parallel thread. This enables you to do other work at the same time (e.g. walking while talking). Each post call generates a task id. You can use this task id to check if a task is running, or wait until the task is finished. ALMemory is the robot memory. All modules can read or write data, subscribe on events so as to be called when events are raised. Please be aware that ALMemory is not a real-time synchronization tool. ALMemory is an array of ALValues (for further details, see: ALValue library). Variable access is thread safe. We use read/write critical sections to avoid bad performances when the memory is read. For further details, see: ALMemory. A few modules expose also some events. 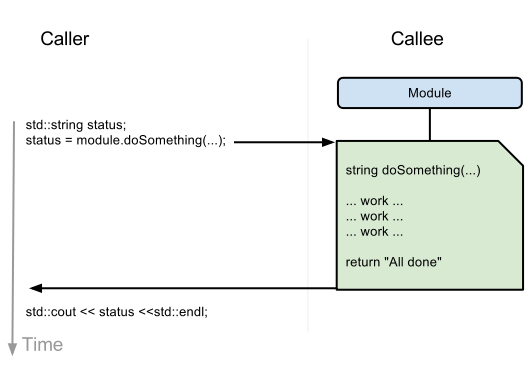 You must subscribe to event from an other module, using a callback that must be a method of your subscriber. For instance, you can have a module called FaceReaction containing a method onFaceDetected. You can subscribe the FaceReaction module to the FaceDetected method of the ALFaceRecognition module with the onFaceDetected callback. This will cause the face detection algorithm to run, and every time a face is detected, the onFaceDetected callback will be called. To see how this is done in Python, please see the Reacting to events section.